You'll be £10.00 closer to your next £10.00 credit when you purchase Wellington's Redjackets. What's this? The assault was failing. Wellington's men had stormed the walls of the great frontier fortress of Badajoz only to be beaten back with terrible losses. Then on the keep of the old castle the French flag was torn down and a British officer's red jacket was hauled up the flagpole. It was the signal – the British were inside Badajoz! This was one of the most famous incidents during the Peninsular War and marked not only the turning point in the capture of Badajoz but of the entire conflict. The jacket belonged to Lieutenant James MacPherson of the 45th (Nottinghamshire) Regiment. The 45th had landed with Wellington at Mondego Bay in 1808 and fought with him throughout the entire Peninsular War gaining more battle honours than any other line regiment. 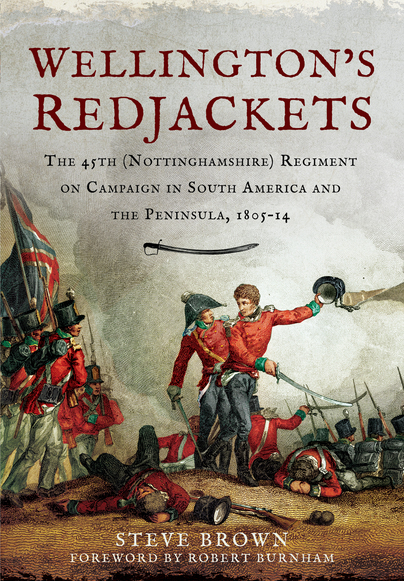 Wellington's Redjackets, The 45th (Nottinghamshire) Regiment on Campaign in South America and the Peninsular War is one of the most detailed unit histories ever published of a regiment during the Napoleonic era. As the first, and only, study of this regiment, Wellington's Redjackets will undoubtedly be an essential purchase for those interested in Napoleonic warfare. of Lisbon. These do not detract from the book. All in all, the book is a nice addition to British regimental histories. Recommended. During the Peninsular War 1805-1814, the Duke of Wellington’s men were assaulting the important, French held, fortress town of Badajoz. They were being beaten back by the defenders, but suddenly, in an incident which was to mark the turning point in the entire conflict, the French flag flying above the keep of the old castle was torn down and a British officer’s red jacket was hauled up the flagpole in its place - the British were inside the defences! The jacket belonged to Lieutenant James MacPherson of the 45th (Nottinghamshire) Regiment of Foot. The 45th had landed with Wellington at Mondego Bay in 1808 and fought alongside him throughout the rest of the Peninsular War, gaining more battle honours than any other line regiment in the process. Following a foreword by Robert Burnham, the book is organised into eight parts, each dealing with a year of the war, from the early years through to Orthez and Toulouse in 1814. There is also an introduction by the author, 18 monochrome illustrations, 19 maps, a selected bibliography, information on sources and an index. This really is an excellent regimental history of the period. The Peninsular War of 1808 to 1814 was, perhaps, the principal theatre of war during the wider Napoleonic Wars where Britain was able to make a significant contribution to the fight against Napoleon on land. Anyone with an interest in British history will have heard of the Duke of Wellington and his campaigns against the French in Portugal and Spain. Many will also have heard of the exploits of the legendary 95th Rifles or the almost equally famous 52nd Regiment of Foot, another light infantry unit. Numerous other regiments, of course, fought under the duke’s command during the campaign, many of which also have a rich an interesting history; yet so little is heard about them outside of official regimental histories or brief mentions in other works. Thanks to author Steve Brown, we can now learn much about the 45th Regiment of Foot, which clearly rates amongst some of the best in the Peninsula. Although this title largely concentrates on the 45th in Portugal and Spain, the book begins with the regiment in South America, a theatre of war that still remains under-studied in the history of the Napoleonic Wars, thus offering the reader something more than just details of the fighting on the Iberian Peninsula. However, the story really begins when the regiment landed in Portugal in late 1808, after which the author chronologically examines the activities of the battalion, which remained in the Peninsula until the end of the war in 1814. (The book itself is separated into parts, each examining a full year of the war while being further subdivided into three to five chapters.) The 45th would take part in – or at least be present at - the battles or sieges of Rolica, Vimiera, Talavera, Busaco, Fuentes D'Onoro, Ciudad Rodrigo, Badajoz, Salamanca, Vittoria, Pyrenees, Nivelle, Orthes and Toulouse; making it one of the most experienced of Wellington’s infantry regiments by the time of Napoleon’s first defeat. One could even argue that the 45th should take pride of place alongside the legendary 95th Rifles and 52nd Foot. Overall the book is extremely well written and enjoyable to read. It is packed full of detail and, although there are none of the usual illustrations or images, there are many useful maps. This book should appeal to anyone with an interest in the Napoleonic Wars, and especially those with a particular enthusiasm for the Peninsular War. It deserves five out of five stars! Overall an excellent book, and an unusual one. Steve Brown is a 53-year-old Australian, resident in Melbourne. He is Design Director for a major lighting design consultancy but has an interest in Napoleonic studies dating back to his teenage years; he has amassed a collection of about 2,000 volumes on the subject, with a particular focus on the British Army.